Pac-12 men's college basketball game. Washington wearing purple jerseys and shorts while Washington State is in white. F – Shawn Kemp Jr. Telling the students to get rowdy for the cameras during the National Anthem sure was a dumb choice. Singer handled it with aplomb. Kemp and Railey trade baskets to get things started. Doesn't look as if Jarreau is wearing a brace on his surgically repaired right knee. However, he's running a bit gingerly. Timeout Washington State. Huskies lead 8-2 with 17:17 left in first half. UW is out to an 8-2 lead three minutes in and Kent calls timeout. Four students in banana suits just walked in and planted themselves behind the hoop WSU is shooting on. Lacy hits a deep 3 with the clock winding down to get the crowd back in it. Andrews, Lacy's childhood friend, responds with his own. First media timeout. Washington leads 11-8 with 15:52 left in first half. Junior Longrus and Ny Redding into the game for #WSU following the media timeout. Darin Johnson is in for Washington. Anderson is out. Kernich-Drew's second 3 gives #WSU a 14-13 lead. Lacy hits one next trip down. Kernich-Drew and Lacy drain three-pointers that puts WSU up 17-13. Donaven Dorsey ready to check in for Washington. UW hasn't had a field goal in eight minutes against WSU's zone. The Cougars lead 26-17 with 8:00 left. Its taken a little over 10 minutes to go from being up by 6pts to being down by 9 pts. You'd think Romar would use a timeout to figure things out. He seems content with going into halftime with a deficit. "as long as we're behind by halftime, we're fine"
Williams-Goss drains three-pointer after Huskies missed previous nine FGs. Washington trails 26-20 with 7:04 left in first half. Dorsey is now 3-19 from 3pt range in the last 3 games. A bunch of those have looked good...struggling. Great to see Verne Harris back on floor & reffing @UW_MBB at @WSUMensHoops tonight on @ESPNU, surgery for colon cancer not too long ago. Que Johnson hits a 3 to put #WSU up 33-22 with 5:19 left. The Cougars are 6 of 8 behind the arc. Washington timeout. Que Johnson drains a three-pointer to put WSU ahead 33-22 with 5:19 left in first half. congratulations to everyone that was able to find this page on the redesigned Seattle Times site. UW takes its first lead since there was 15:42 left in the first half on Darin Johnson's free throws. Johnson hits two FTs to give Washington first lead since opening minute. Huskies lead 63-61 with 10:46 left. Iroegbu takes the lead back with another bucket and foul. 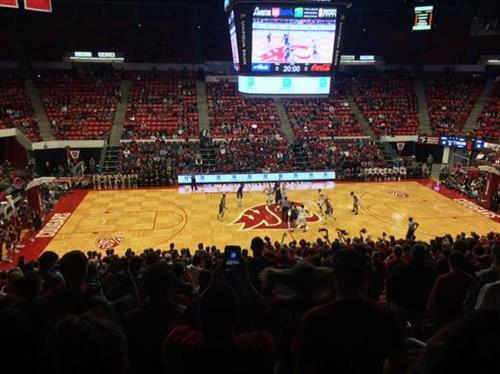 #WSU leads 64-63 with 10:30 left. Hawkinson very casual about that block. Iroegbu leaves after picking up his fourth foul. He's got 9 on 2 of 3 shooting. Andrews sets a new career high. He has 24 points. Que Johnson with about as absurd a basket while being fouled as you'll see.